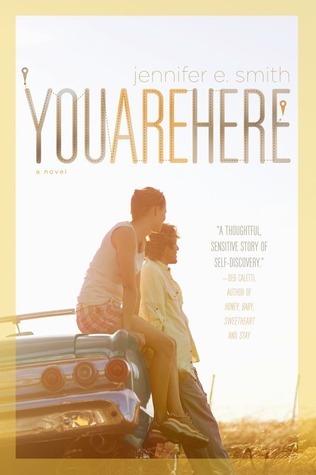 I'm very honored to be able to welcome Jennifer E. Smith on to the blog today. It's been a while since I've been able to do this feature, and I'm pleased to have one of the authors I love being featured this week! I think Jennifer's writing is beautiful and fluid, and I love the characters she's managed to create in the two novels I've read from her so far. See my reviews of her amazing books The Statistical Probability of Love at First Sight and You are Here! Alexa: How did you come up with the characters of Peter and Emma (in You Are Here)? I'm especially curious to hear how their personalities (quirks and all) came to be. Alexa: Who are your top three fictional book characters? Alexa: If you could slip into any character's life for a day, who would it be and why? Jennifer: I love the idea of being inside the world of Harry Potter. I mean, who doesn't want to spend a day at Hogwarts? But while Hermione is one of my all time favorites, I think I'd want to go as Harry. Or maybe Dumbledore! It's a road trip book, for one thing, and it's a road trip that leads to a transformation of a character. I loved the quirkiness of Peter and Emma, and thought they were incredibly unique. It's slow-paced, but I found that utterly lovely and enchanting. Love this new feature! So want to read You Are Here!